The BMW 2 Series might be the purest driver’s car in the BMW stable. What do you need to know before you buy a 2 Series? Don’t worry, we’ll tell you everything right here in the Ultimate Buyer’s Guide. The 2 Series is the latest version of the kind of car that made anybody care about BMWs at all (other than bubble-car enthusiasts): small two-door sedans/coupés that make you want to thank Motor Jesus that you know how to drive. The 2 Series is the replacement for the 1 Series, the former smallest BMW that was the rebirth of the venerable 2002 and closest spiritual heir to the popular E30 3 Series of the 1980s. The good news is that the 2 doesn’t fall prey to the usual fate of replacements coming in too big, too heavy, and missing the point. Yes, the 2 is bigger and heavier than the old 1, but it still completely on message. That message is, of course, driving is great. It’s big enough to be a practical daily driver, and not a wasted bit bigger. It starts at $32,850, so it’s not even all that expensive. The 2 Series is one of those rare cars that was designed more for the process of driving than the result, and you feel the results of that fundamental decision in everything you do in the car. The steering is one of the best electronically-assisted setups we’ve driven, responsive and with a good amount of feedback from the road. The car is balanced and feels just right, in that deep, pit of your groin sort of way. It’s an old-school RWD sports coupé made with modern stuff. The turbo inline six has more power, sure, and more is fun, but the heavier motor does tweak the balance just a bit. We feel like the four is all most people will need, as it’s a great engine with a surprising punch. The automatic does a remarkably good job in these cars, and can let you focus more on other parts of driving, but we really prefer the manual, which is an extremely satisfying six speed. The auto can do everything quicker and better than you can, but why give the robots all the fun? BMW took the wraps off its new 2 Series a few months before the 2014 Detroit Auto Show. They showed the world, essentially, a new 1 Series M Coupe. That’s a great thing, because the 1 Series M Coupe was a great back-to-basics BMW. That new 2014 2 Series, like the 1 Series M Coupe, was small, lightweight, came with a stick shift and beautifully balanced. Add to that the fact that it was relatively inexpensive, and the 2 Series might be the enthusiast’s choice BMW in their lineup. In 2015, BMW made all-wheel drive available on 228i coupe and convertible models as well as on the M235i coupe. The following year, 2016, the M235i convertible also got the chance to route its power to all four wheels, and the M2 made its debut. Powertrain options are essentially the same as what you find in a 3 Series, 4 Series, X3 or X4: a 2.0-liter turbo I4 and a 3.0-liter turbo I6. That 2.0-liter, like in the aforementioned applications, puts out 240 horsepower, while the 3.0-liter makes 320 horses in M235i form or—thanks to unique pistons, main bearing shells, turbocharger, exhaust manifold and oil sump—365 ponies when in the M2. The base 228i coupe, M235i coupe or M235i convertible are all available with either a six-speed manual or eight-speed auto, while convertible 228i, xDrive 228i or xDrive M235i models come only with eight-speed automatics. The M2 comes gets either a six-speed manual with rev matching or a dual-clutch seven-speed automatic. Acceleration times are brisk across the board, with the 228i convertible bringing up the rear with a 0-60 mph time of 5.7 seconds. The all-wheel 228i xDrive Convertible gets there a tick faster. Throw a roof on the 228i and those numbers improve. The manual 228i shoots to 60 in 5.5 seconds, and the auto gets there in 5.4. Add all-wheel drive, and the number improves a tick to 5.3 seconds. Things drop into the fours with the inline six. Okay, so the convertible manual M235i takes five seconds to get to 60, but the auto gets there in 4.8 ticks in two-wheel drive or 4.7 seconds in xDrive form. The coupe M235i manual does the deed in 4.8 seconds, the auto gets there in 4.6 and the xDrive auto scorches to 60 in 4.4 seconds. The manual M2 accelerates to 60 just as quickly as the M235i xDrive Coupe, but tick the automatic box and that seven-speed dual-clutch auto will bring the 0-60 time all the way down to 4.2 ticks. Fuel economy numbers are about the same as those of the BMW 4 Series with the same powertrains. The 2.0-liter will score in the mid 30s on the highway and 27 combined, while the 3.0-liter will roll along the highway making 28 MPG and up to 24 combined. All-wheel drive doesn’t seem to affect fuel economy significantly, though the manual transmission does, particularly on 3.0-liter models. No fuel economy information for the M2 is available yet, but expect it to be in the high 20s on the highway and in the low 20s combined. 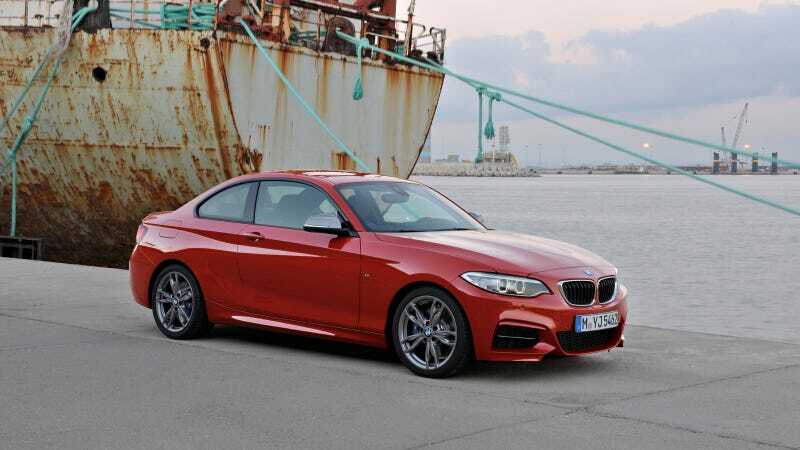 The BMW 2 Series comes in three main trims: 228i, M235i and M2. The former two can be had with all-wheel drive, convertible tops or both. The M2 comes only in rear-drive coupe form. Steering for all 2ers is electric and suspension is a five-link independent design in the rear and double pivot strut type up front. Brakes for the 228i are 12.3-inch vented rotors in the front and 11.4-inch vented discs out back. M235i models replace those front discs with bigger 13.4-inch plates, while the M2 gets 15-inchers in the front clamped by four-piston calipers and 14.5-inchers out back clamped by two-piston calipers. 228i: Starts at $32,850. Notable standard features: 240 horsepower 2.0-liter turbo I4 with stop/start, six-speed manual or eight-speed auto with launch control, 17” alloy wheels, SensaTec vinyl seats, push-button start, driving dynamics control with various drive modes, automatic climate control, manually adjustable front seats, Dynamic cruise control, iDrive with 6.5-inch display, tilt/telescoping steering column, rain-sensing wipers. Notable options: any metallic paint ($550); Leather seats ($1,450); 18" alloy wheels ($600); heated front seats ($500); Cold weather package: retractable headlight washers, heated front seats, heated steering wheel ($700); Driver Assist Package: park Distance Control, Rearview camera ($950); Driver Assistance Plus: Speed limit info, active driving assistant, automatic high beams ($700+Driver Assist Package); Premium package: Auto-dimming mirrors, keyless entry, power front seats, satellite radio, lumbar support, ambient lighting, moonroof, universal garage door opener ($2,950); Track Handling Package: M Sport Brakes, variable sport steering, adaptive M Suspension, 18" alloy wheels ($2,300) Technology Package: M Sport Package: M steering wheel, rear spoiler, aerodynamic kit, M Sport or adaptive M suspension, leather interior, unique interior and exterior trim ($2,500+leather seats+metallic paint color); Lighting Package: Xenon headlights, adaptive light control ($900); Luxury Package: Leather seats, unique interior trim, 18" alloy wheels ($350+leather seats+alloy wheels+Premium Package); Harmon Kardon 360W 12-speaker Sound System ($875). 228i xDrive Coupe: Starts at $34,850. Notable standard features over 228i: all-wheel drive. Notable options: same as 228i. 228i Convertible: Starts at $38,650. Notable standard features over 228i: Convertible top. 228i xDrive Convertible: Starts at $40,650. Notable standard features over 228i: all-wheel drive and convertible top. M235i Coupe: Starts at $44,150. Notable standard features over 228i: 3.0-liter turbo I6, M Sport brakes, eight-speed auto with launch control or six-speed manual, adaptive M suspension, variable sport steering, sport exhaust system, 18" alloy wheels, Xenon adaptive headlights with auto-leveling, aero body kit, rear spoiler, 10-way power front seats with adjustable side bolsters and lumbar, driver memory for mirror and seat. Notable options: any metallic paint ($550); Leather seats ($1,450); heated front seats ($500); Cold weather package: retractable headlight washers, heated front seats, heated steering wheel ($700); Driver Assist Package: park Distance Control, Rearview camera ($950); Driver Assistance Plus: Speed limit info, active driving assistant, automatic high beams ($700+Driver Assist Package); Technology Package: Navigation, real-time traffic information, instrument cluster with extended contents ($1,950); Limited slip diff ($3,240); Harmon Kardon 360W 12-speaker Sound System ($875). M235i xDrive Coupe: Starts at $46,150. Notable standard features over M235i: All-wheel drive, panoramic moonroof. Notable options: Same as M235i Coupe sans the limited slip diff. M235i Convertible: Starts at $48,750. Notable features over M235i Coupe: Convertible top. Same options as M235i Coupe. M235i xDrive Convertible: Starts at $50,750. Notable standard features over M235i: eight-speed auto only, all-wheel drive, convertible top. Same options as M235i xDrive Coupe. M2: Starts at $51,700: Standard features and optional content not yet available. What we know: Notable standard features: 365 horsepower turbo I6, six-speed manual transmission with rev matching, wider track with lightweight suspension components, variable Active M electronically controlled limited slip differential, unique electric power steering, big brakes, navigation, 19-inch alloy wheels, M Dynamic Mode (stability control mode that allows for controlled drifts), Michelin Pilot Super Sport tires, leather sports seats, unique interior trim, unique exterior aerodynamic treatment. Notable options: seven-speed dual clutch automatic transmission with heavy duty transmission cooler, collision warning, lane departure warning, Pedestrian Warning with City Braking. We think the sweet spot of the 2 line is the basement. It’s hard to argue with a 228i with the manual, the slightly better sound system, and that’s pretty much it. That was basically the Jalopnik-spec one we took across country, slept in, and even peed in. It was a car we drove for a week straight and didn’t get bored with. Sure, you could get the six, you could get more toys, you could get an auto, but what’s the point? Save your money for good food and beer and enjoy the primal, base joy of the closest thing you can get to an old-school, back to the core of what makes driving great small BMW. But if you’re gonna go big, the M2 seems like it may be the best car to wear that badge in a generation. Buy one, humiliate M3 owners at the track, feel good about yourself every day.